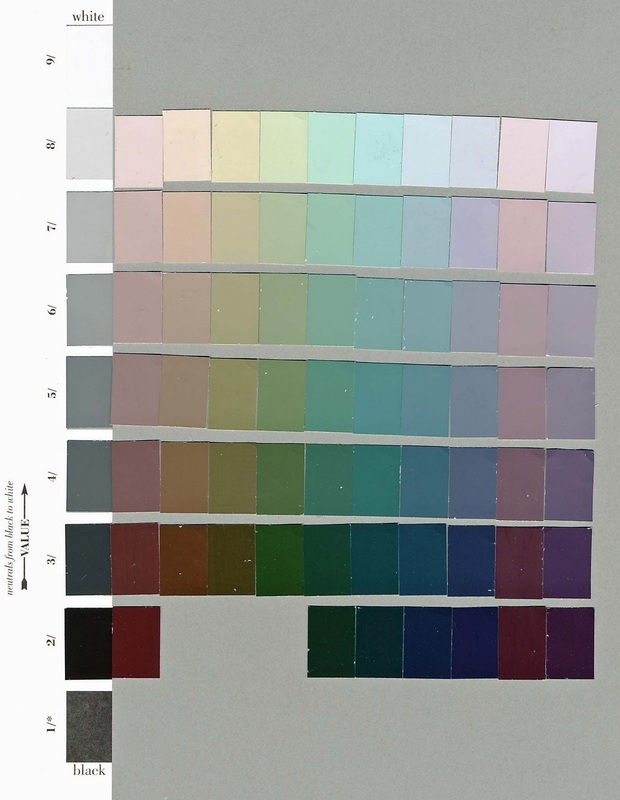 As part of my color study group, I did something interesting yesterday with my Munsell color chips. I created a palette of colors which are near neutral - just this side of grey - with just a hint of hue. And included a full range of values. Here is a color photo of the result; which is not quite true. It looks richer and greyer in person. Also I took a photo in black and white so you can see that this is a full palette of values. What the colors have in common is that they are the lowest chroma/saturation in their respective categories. Here is how I did it. First I created a column of chips (on the left) that ran from white at the top to black at the bottom - a typical gray scale. Next I selected the chips with the lowest chroma/saturation from my Munsell Color Handbook. Since the Munsell color tree uses 10 hues; I ended up with ten columns of differing hues (red, yellow red, yellow, green yellow, green, blue green, blue, purple blue, red purple, purple). I lined up the chips within each hue in value order; lowest at the top and darkest at the bottom. I find this palette absolutely fascinating. The values are the same across the rows. Each column is a different hue. It never occurred to me the breadth and beauty of a palette of near neutrals. Just the term neutral makes it sound dull and boring. But there is enough value distinctions and color differences to create wonderful designs for a lifetime.